Danny Boyle returns to his British roots with this psychological thriller – but how will this compare with his big-budget affairs from across the pond? Simon (James McAvoy) is hit on the head during a robbery at an auction house and forgets where he hid a sought-after painting. 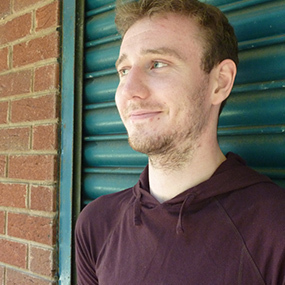 When Simon is captured by the failed robbers they enrol a hypnotherapist to access his missing memory, leading to much more than they bargained for. 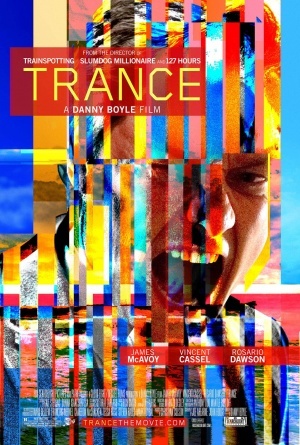 Trance returns Danny Boyle to Britain for a reasonably static narrative, focusing on character more than action. The film’s only major action sequence occurs at the start of the film centring on the heist which is executed sublimely by Boyle, expressing the energy and audacity of the criminals with a clever opening narration by McAvoy. After the heist the film slows to a snail’s pace in narrative progression but keeps the audience interested with a psychological element provided by Rosario Dawson’s hypnotherapist, Elizabeth. Dawson has a strong presence on screen as an independent and strong minded manipulator of the mind, equalling the presence of the brilliantly captivating Vincent Cassel who plays the tough but slick thief, Franck. James McAvoy is the only puzzle to Trance; he plays a man who fears for his life but hardly expresses any concern at all. At one point he bizarrely walks potentially to his death smiling like a child, only in later scenes does he become more convincing, expressing confusion at his own amnesia and exuding bravado when necessary. The film’s shining glory is in the continual intertwining of fact and fiction but unlike Soderbergh’s Side Effects, these fictions don’t undermine the major narrative or characters in the film. A second viewing will unlock an intensely different film and a clearer understanding, as these fictions are repetitive, plausible and entirely persuasive. Trance is a highly enjoyable take on the traditional set up of a gun, a girl and a messed up brain which creates something original, dark and fun.